My passion for all things historical led me down the path of U.S. Presidential china upon my latest research endeavors in fiction writing. In order to stay true in my writing to events, places and people, I end up doing hours and hours of research pertaining to clothing styles, weather patterns, and, yes, dinnerware too. A part in The Protectorate initially described Anna’s reaction to the glamorous dinner table setting at her Director’s house, but in the end I decided to take it out for various reasons. However, I spent a large amount of time researching how Rachel Jackson, President Andrew Jackson’s wife, set her table and the pieces she was known to have used. I find it fascinating to this day how something as common as dinnerware can lead to quite the insight into a person’s personality. So, it was with this flicker of interest that led me to peruse the patterns for all the U.S. President’s, starting with George Washington. Nowadays, Presidential dinners amass quite the number of guests, which means hundreds of place settings designed by none other than our First Ladies. However, that was not always the case. 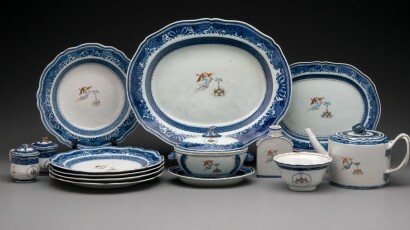 Presidential China wasn’t officially ordered until 1817 by then President James Madison for diplomatic usage. At the handsome price of $1,167.23, manufactured in by Dagoty and Honor and shipped directly from Paris, the 30 place settings and matching dessert plates were sure to dazzle any diplomatic representative. So, what did George Washington eat on for his daily meals? Well, I’m happy you asked! Most fashionable people, and George dressed to impress, ordered the “Canton” blue and white china for everyday usage. It was called “Canton” due to the place of origin being Canton in southern China where traders brought it back to European markets for purchase. As these weren’t readily made in the Continental States at that time, Washington ordered his from across the pond in London to satisfy his noble needs and wants. However, after 1772 Washington never again ordered china from England, and an expedition to find a new route to access the famed Chinese porcelain had begun post-revolution, and direct trade between China and the U.S. became a reality. Thanks to Henry “Light Horse Harry” Lee, in 1790 Washington received his long awaited set of china with the emblem of the Society of Cincinnati on it. Click here for more on the background of the Society of Cincinnati and Washington’s role in it. And look at this beauty, crafted for Martha with her initials by a representative of the Dutch East India Company. A 1930’s replica is all yours for a mere $550! Lastly, I’d be remiss if I didn’t include the dining room which inspired all the research. Thanks to whitehousehistory.org, firstladies.org and mountvernon.org for the wonderful history behind it all!